Salvador Juanpere's extensive career as a sculptor is marked by strong questions about the raison d'être of sculpture, which combines with a great respect for the daring sculptors who came before him, from whom he draws thoughts, shares ideas about what the origin of the shape would be, and speculates with them, with philosophers and writers about the complexities of this craft. With the aim of playing down the supposed genius of artistic work, he has drawn up a conceptual map of everything that surrounds him and depicts an interesting world underlying the sculptural phenomenon, which ceases to be secondary to create poetic images. Juanpere manages to give a sculptural category both to material and conceptual supports when dealing with them as representative subjects. Juanpere's work is a permanent praise of intellectual and processual duality, intrinsic to working in workshops. This exhibition emphasizes the initiatory act of indefinable coming-togethers, which has to do with the willingness to create and its inherent problems. In De massa unde fuit plasmatus Adam (1238) the artist reminds us that the most primitive way for any creator is the mould of his own hand. In Et requievit die septimo, created almost three decades ago, the religious mythology about how the world was created over six days with the seventh day being devoted to divine rest, is joined with each of the six elements (quarks, basic elements of all matter observed in particle accelerators). This parallelism suggests that the names given by the scientists could have marked, day by day, the script of the creation, in an attempt to make us notice the spiritual side of science. The unprecedented installation made for this exhibition with fourteen stones from the Montserrat mountain, He who carves sculptures merely speeds up the breaking down of the mountains, evokes words that Marguerite Yourcenar attributes to the Renaissance sculptor Michelangelo. Juanpere's gaze at the mountain range of Montserrat could not remain alien to his frequent disquisitions about the double destructive-constructive condition of nature involved in the act of creation. 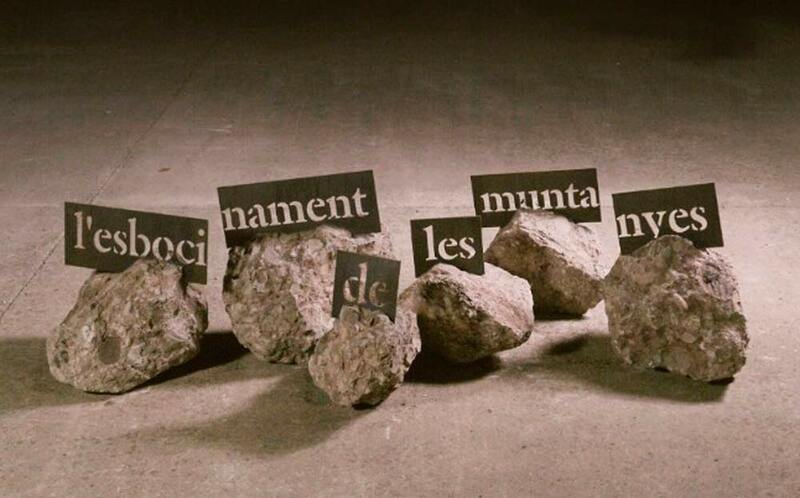 The steel plaques with the explicit phrase are embedded within each stone; it seems that the mountain will be sawed in a curious metalinguistic game with the name Mont-Serrat (meaning serrated mountain) and, above all, they appeal to the idea of putting in the first wedge and opening the stone to tackle the creative action.